Len Brown was in a meeting where there was “full, frank and robust discussion” where he also went on to say of regaining the trust of his councillors that “This is my focus, starting today”. Look I’m not a crass person, but the only way I can describe what I am feeling is that Len Brown spent 2 years screwing his mistress and now he is screwing Auckland. Remember he said that rebuilding his relationships with councillors is now his ‘focus’, not a ‘desire’ or ‘would be best’ but his ‘focus’ all because he couldn’t keep it in his pants. I want the mayor of my city to be focused on the issues of the city he was elected to oversee…not rebuilding broken relationships. You have to draw the logical conclusion that Mayor Len Brown is corrupt. He may cry, as the left footers do, ‘mea culpa, mea culpa, mea maxima culpa’ (“through my fault, through my fault, through my most grievous fault“) but what he has done is the definition of corruption (let alone the credit card situation when he was the Mayor of Manukau). So let me ask you the question, how many times do you need to commit a corrupt act (even unwittingly) to be corrupt? For the first time I’ll say it…because of the fact that Len Brown’s focus is not Auckland, but rebuilding relationships that he himself ruined and because for ever more the words ‘corrupt’ and ‘Len’s Brown’s mistress’ will swirl around him, it is time he stood down. I have written before about why Len Brown’s infidelity should matter to Aucklanders which you can see here but I am now resolute in my position. 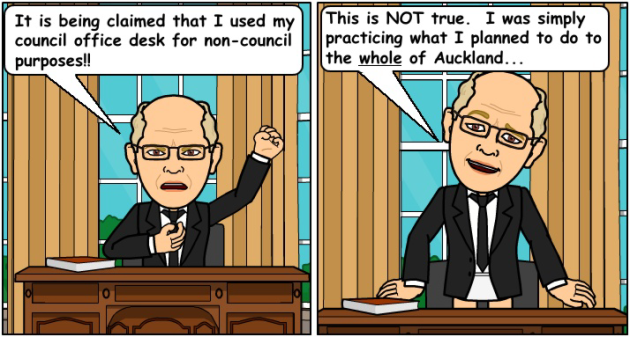 Auckland deserves better than a Mayor that the current incarnation of Len Brown. Couldn’t agree more – well written. He keeps saying, as do the rest of similar leaning politicians, that he is determined to “get on with the job”. Spending more of our money on bureaucracy as well as other things we do not need, until the money runs out.